What was the medical inspection process for immigrants hoping to enter the United States through Ellis Island in the late nineteenth/early twentieth centuries? The United States is a country of immigrants: some arrived across a bridge of land from what is today Russia, some as Pilgrims or pre-Revolutionary War colonists, others from Europe or Asia in the 19th and early 20th centuries, still more waded across the Rio Grande River from Mexico and points south, while others fled as refugees from armed conflict in various regions of the world throughout history. Today most arrive by plane, but in the late 19th and early 20th centuries, most arrived on steamships from Asia or Europe. Of those immigrants, most entered America through the city of New York first at the Castle Garden processing center run by the state of New York in lower Manhattan and then through the Federal immigration station constructed on Ellis Island (Yans-McLaughlin and Lightman, 1997). The procedure included a brief, but crucial, medical inspection for those hoping to be registered and enter the country. Ellis Island is located in New York harbor and was gradually enlarged through fill dirt created as a by-product of the construction of New York City's subway system (Ford, 1997). The island itself is small, only 27 acres, (Ford, 1997; Perec, 1994) and yet it played a crucial role in the history of the nation, as well as the personal family histories of millions of Americans. This immigration experience is now memorialized on Ellis Island which was extensively restored and reopened as a museum in 1990 (Wallace, 1991). Visitors to the museum can retrace the steps of the millions of immigrants who were processed for entrance through the "Golden Door" leading from the Old World, through Ellis Island, and into the United States (Wallace, 1991). 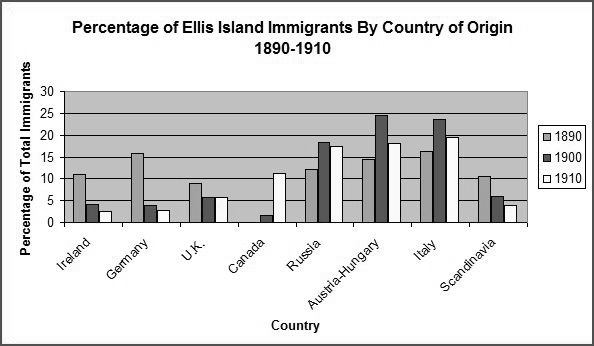 During this period the immigrants arriving in New York harbor were primarily emigrating from Eastern and Southern Europe. They were Jews fleeing the anti-Semitic persecution and pogroms in Russia, Poland and Eastern Europe, (Markel, 2000) and Italians by the millions searching for jobs, better opportunities and a better way of life (Yans-McLaughlin & Lightman, 1997) . The journey by steamship averaged between ten to fourteen days, and could be miserable for those crammed into steerage class accommodations (Benton, 1985). Conditions were usually overcrowded, with poor ventilation, and often unsanitary with seasick passengers everywhere and varying toilet facilities (Benton, 1985). Ellis Island main building circa 1905. Original wooden structure burned in 1897. On January 2, 1892, the immigration station established at Ellis Island opened to receive its first boatload of these immigrants with Annie Moore, a young Irish girl arriving with her family, being the first immigrant to be registered on the Island (Perec, 1994). Between Miss Moore's arrival in 1892, and the final departure from the island in 1954 of a Norwegian detainee named Arne Peterssen, (Perec, 1994) approximately sixteen million immigrants passed through Ellis Island (Coan, 1997; Ford, 1997; Perec, 1994). The facility at Ellis Island was intended to process around five thousand immigrants per day, including inspections for "physical, economic, mental and moral fitness, but by 1907 it was not uncommon for more than ten thousand to pass through . . . on any given day” (Markel, 2000, p.549). After spending several hours going through the medical inspection and immigration interviews, the vast majority continued their journey across the harbor to begin a new life in America (Birn, 1997; Yew, 1980). For a handful of the hopeful however, their dreams were dashed in the medical inspection line, and they were returned to their ports of origin after failing the inspection.